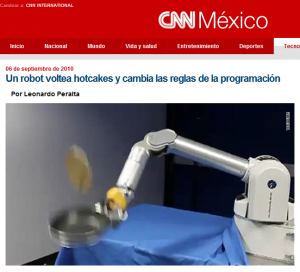 CNN Mexico wrote an article about my pancake flipping robot. 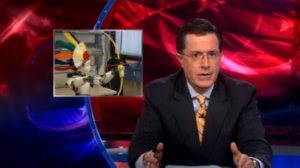 Colbert Report TV show in US featured my iCub experiment video in their show on September 30, 2010. SERVO Magazine published an article featuring the iCub robot and the archery task, albeit with numerous factual errors. 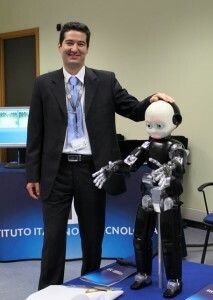 NewScientist TV featured the iCub robot on Dec 8, 2010, under the title “Robotic Robin Hood: Archery for automatons”. The interview with me was broadcasted on Bulgarian National Radio on April 19, 2011. Audio recording is available here. Робот стреля с лък, унищожава човечеството след някоя и друга година? Robot archer hits bulls eye by 8th try: can you learn to dodge perfectly in 7? Robô arqueiro atinge seu alvo na oitava tentativa!